Plan to achieve your financial goals today! FR-Financial, is a financial consulting firm that specializes in offering financial services — specifically, investments and benefits. We work with employees of public schools and nonprofit organizations as well as businesses and individuals. to clearly define short and long-term financial goals, develop and Implement the plan. Our commitment is to help our clients achieve their financial goals and objectives. Moti Gur, a registered representative whose securities are offered through Financial Network Investment Corp. and Cetera Advisor Networks LLC. Is a broker/dealer, and investment advisor, a member of the Financial Industry Regulatory Authority (FINRA) and the Securities Investor Protection Corporation (SIPC). 3807 Wilshire Blvd. Suite 1040 Los Angeles, CA 90010 (213) 385-6237 Video. 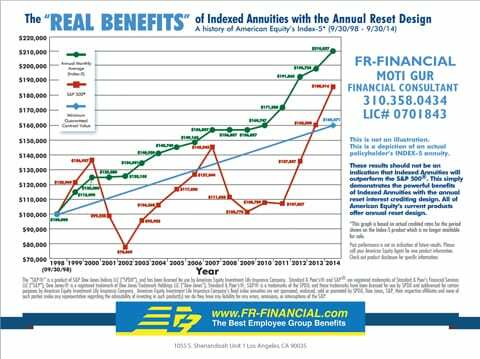 FR-Financial has been in business for more than 35 years. In that time, we have built a massive client base that is over 6,000-strong. We owe this in part to our superb customer service and client-first approach that involves explaining complex topics using easy-to-understand language. Our firm is free to act objectively and with autonomy because we are not obligated to work for a singular company or organization. By providing you with independent financial services, you can invest in competitive products and desirable opportunities. You’ll be happy to know that many of these come with principal guaranteed investments. We are insured in California and our license number is 0701843. You can rely on us to help you meet your financial needs and achieve your goals. At FR-Financial, we want to make sure that our clients’ finances are on the Green Line. What does that mean? Take a look at the chart below, and we’re sure you’ll agree that your money should always stay in the green.